CAIRO (AP) — Egyptian warplanes struck Islamic State targets in Libya on Monday, just hours after the extremist group released a grisly video showing the beheading of several Egyptian Coptic Christians it had held hostage for weeks. An armed forces spokesman announced the strikes on state radio, marking the first time Cairo has publicly acknowledged taking military action in neighboring Libya, where extremist groups seen as a threat to both countries have exploited the chaos following the 2011 uprising. The statement said the warplanes targeted weapons caches and training camps before returning safely. It said the "intense strikes" were "to avenge the bloodshed and to seek retribution from the killers." "Let those far and near know that Egyptians have a shield to protect and safeguard the security of the country and a sword that amputates terrorism and extremism," it said. Libya's air force meanwhile announced it had launched strikes in the eastern city of Darna, an extremist stronghold that was taken over by an Islamic State affiliate last year. The announcement, on the Facebook page of the air force chief of staff, did not provide further details. 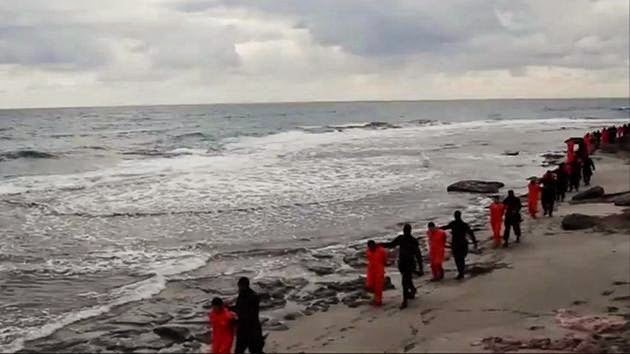 The video purporting to show the mass beheading of the Coptic Christian hostages was released late Sunday by militants in Libya affiliated with the Islamic State group. The killings raise the possibility that the extremist group — which controls about a third of Syria and Iraq in a self-declared caliphate — has established a direct affiliate less than 500 miles (800 kilometers) from the southern tip of Italy. One of the militants in the video makes direct reference to that possibility, saying the group now plans to "conquer Rome." The militants had been holding 21 Egyptian Coptic Christian laborers rounded up from the city of Sirte in December and January. It was not clear from the video whether all 21 hostages were killed. It was one of the first beheading videos from an Islamic State group affiliate to come from outside the group's core territory in Syria and Iraq, and displayed the sophisticated techniques used in previous videos. Libya in recent months has seen the worst unrest since the 2011 uprising that toppled and killed longtime dictator Moammar Gadhafi, which will complicate any efforts to combat the country's many Islamic extremist groups. The internationally recognized government has been confined to the country's far east since Islamist-allied militias seized the capital Tripoli last year, and Islamist politicians have reconstituted a previous government and parliament. Egypt has strongly backed the internationally recognized government, and U.S. officials have said both Egypt and the United Arab Emirates took part in a series of mysterious airstrikes targeting Islamist-allied forces last year. The Egyptian government declared a seven-day mourning period after the release of the video and President Abdel Fattah el-Sissi addressed the nation late Sunday night. The U.N. Security Council meanwhile "strongly condemned the heinous and cowardly apparent murder in Libya of 21 Egyptian Coptic Christians by an affiliate of the Islamic State of Iraq and the Levant," it said in a statement. The foreign minister of the United Arab Emirates, Sheikh Abdullah bin Zayed Al Nahyan, also condemned the mass killing, calling it an "ugly crime." "The United Arab Emirates is devoting all its resources to support the efforts of Egypt to eradicate terrorism and the violence directed against its citizens," he said in comments carried by state news agency WAM. Sheikh Abdullah added that the killing highlights the need to help the Libyan government "extend its sovereign authority over all of Libya's territory."